Meet the young members of Team Kyte that will play at the Ice Hockey tournament at the 2018 Canada Deaf Games. 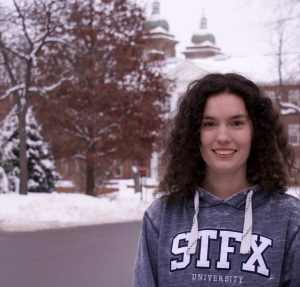 At 19 years of age, Abigayle is a second-year Bachelor of Arts student at St. Francis Xavier University looking forward to a career in law. A leader both on and off the field of play, Abi is House Vice President of St. Francis Xavier University TNT student residence. She represented Canada against the U.S.A at the first Women’s Deaf World Championship exhibition game in Amherst in 2017. Abigayle is a champion lacrosse and hockey player and is currently a member of the St. Francis Xavier rowing and lacrosse teams. She was a Box Lacrosse Ontario Provincial Champion (2012), a silver medalist in lacrosse at the Ontario provincials (2013) and an Ontario Federation of School Athletics Association competitor in hockey. She also enjoys swimming, touch football and softball. 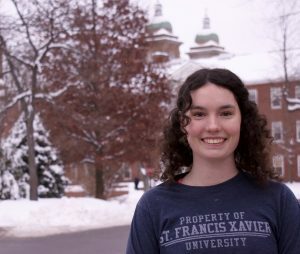 At 19 years of age, Emma is a second-year student at St. Francis Xavier University, working towards a B.A. in Human Kinetics with a Major in Psychology. She is looking forward to a career in audiology and working with children who have a level of hearing impairment/deafness. A leader both on and off the field of play, Emma is House President of St. Francis Xavier University Chillis student residence. She represented Canada against the U.S.A at the first Women’s Deaf Championship exhibition game in Amherst in 2017. Emma is a champion lacrosse and hockey player and is currently a member of the St. Francis Xavier rowing and lacrosse teams. She was a Box Lacrosse Ontario Provincial Champion (2012), a silver medalist in lacrosse at the Ontario provincials (2013) and an Ontario Federation of School Athletics Association competitor in hockey. Emma also enjoys swimming, golf, touch football and softball. 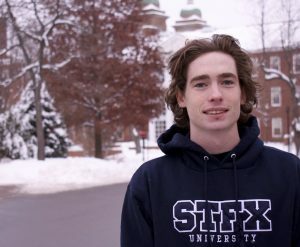 At 22 years of age, Sean holds a Diploma in Carpentry from Algonquin College (2014) and is currently a fourth-year student at St. Francis Xavier University in Business Administration with a major in Management. He is planning on a career in professional sport management. 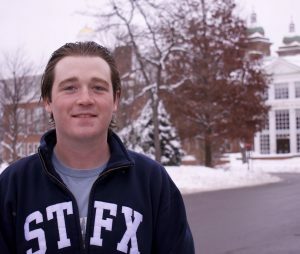 A leader both on and off the field of play, Sean is a past House President of St. Francis Xavier University MacNeil student residence and enjoys volunteering with The Best Buddies University Program. Sean was a silver medalist at the World Deaf Championships with Team Canada in Amherst, U.S.A (2017) and Assistant Captain of the Renfrew Timberwolves Junior B hockey team (2013-2015). He is an accomplished golfer, as well as a hockey and aquatics instructor. “It’s an unbelievable, humbling experience to be able to play with my cousins and uncles. This opportunity will not come around again, so I want to take advantage of it. I cannot wait to be in Winnipeg with our team to win gold. Team Kyte will be fast, smart and strong, so I wish luck to all other teams that are participating,” said Sean. At 21 years of age, Thomas is a third-year student at St. Francis Xavier University in Business Administration. His future plan is to pursue a career in managerial accounting. Thomas represented Canada on the National Deaf Hockey Team at the Deaflympics 2015 in Russia and the 2017 World Championships in Amherst, U.S.A — winning a silver medal at both. He enjoys hockey, swimming, golf, soccer and is a member of the St. Francis Xavier Lacrosse Team. Thomas excels as a runner and recently finished third at his first marathon, the Cape Breton Fiddlers Run. Thomas is set to reach his goal of qualifying for the Boston Marathon in 2018. “I am extremely excited to represent my family in February alongside my father, siblings, cousin and uncles ,” said Thomas about his participation in the 2018 Canada Deaf Games. 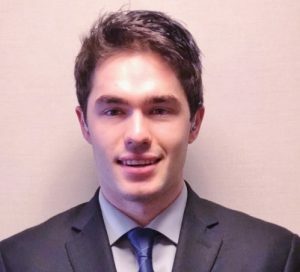 At 22 years of age, Johnny Kyte Jr. is attending the University of Southern Maine (USM) on an academic scholarship, pursuing a degree in Exercise Science. He is a member of the NCAA USM men’s varsity hockey team. His career plan is to work as a physiotherapist, chiropractor or athletic therapist. Johnny was a silver medalist and Assistant Captain at the World Championships with Deaf Team Canada in Amherst, U.S.A (2017) and a Silver Medalist at the 2015 Deaflympics with Team Canada in Russia. He played CCHL Junior A hockey with the Kanata Lasers and Smiths Falls Bears and was Assistant Captain with the Pembroke Lumber Kings. Johnny is an accomplished athlete and enjoys playing golf, squash, pond hockey, skiing and swimming. He is committed to community service, dedicating his time to organizations such as the Special Olympics and the Carp Community Association. At 21 years of age, Alyssa Godin is attending Brock University in St. Catharines, Ont. where she pursues a degree in Biological Sciences and plans to get into medical school. Godin is native of Timmins, Ont. Godin has been playing hockey since she was six years old. In her last year of high school, an injury took away her NCAA scholarship and forced Godin in taking a break from hockey to recover. She hopes to get back to that level, so that she can play in the NCCA or Sport. 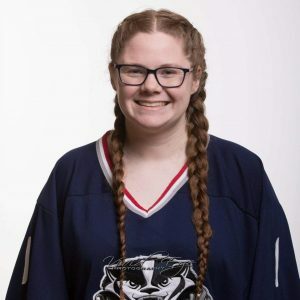 However, she was able to represent Canada in the first women’s hockey exhibition game at the 2017 World Deaf Ice Hockey Championship in Amherst, U.S.A. Deaf hockey has provided Godin with opportunities to improve her game, and get back into playing regularly. This season, she is playing with the Brock University’s Badgers team. She looks forward to playing with Team Kyte as their goalie at the 2018 Canada Deaf Games.